i b i k e l o n d o n: One step forward, two steps back; what next for cycle safety in London? One step forward, two steps back; what next for cycle safety in London? Last week saw the launch of the substantially separated Cycle Superhighway 2 extension in Stratford, by Mayor Boris Johnson. As I previously wrote in this post, whilst not 100% perfect CS2X is already head and shoulders above anything previously built here in London. Indeed, there was more good news to come, but is London taking two cycling steps back for every one it takes forward? At the launch, the Mayor unveilled plans for similar changes on the road network in London, plans to upgrade existing cycle superhighways, and an entirely new north-south cycle superhighway route through central London. The positive news is that this will involve recruiting some 128 new cycle-specific planners, designers and engineers to implement these plans at Transport for London HQ. The rest of Cycle Superhighway 2, from Bow to Aldgate, will be entirely re-modelled and substantially segregated, whilst the Aldgate gyratory itself will be completely removed and returned to two-way working with cycling facilities included - a major coup for cycle campaigners and bloggers who have been pushing that agenda for months now. 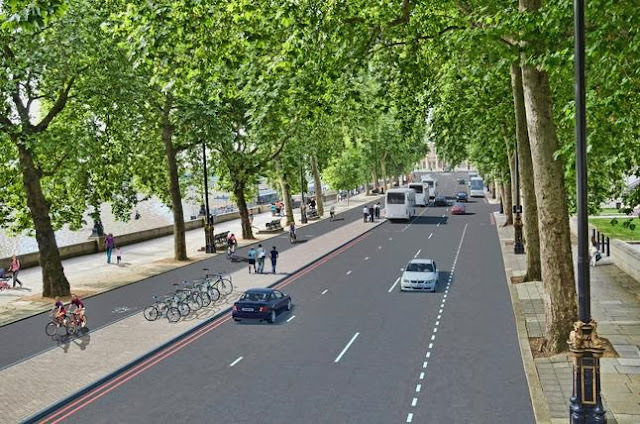 The proposed "north south cycle superhighway on Blackfriars Road approaching TfL's HQ, Palestra, on the right of the image. And the new north-south superhighway will intersect with the proposed east-west route, or "Crossrail for bikes" as the Mayor calls it, at the dangerous Blackfriars Bridge northern junction (where bicycles already account for 43% of rush hour traffic) which will be very significantly remodelled in order to safely accommodate additional riders - another coup for campaigners as Blackfriars is really where the genus of the space4cycling movement began, back in 2011, under the guidance of this blog and Cyclists in the City. Boris Johnson said; "I share people's impatience for change. We have taken the time to ensure that it is done properly - but that physical change is now underway." That ethos of "doing things properly" can be attributed to London's cycling commissioner, Andrew Gilligan, who has been banging heads together behind the scenes at Transport for London and working on the basis that if infrastructure is going to be built that more vulnerable cyclists are to be expected to ride on then it must be done properly, as evidenced at Stratford. He's also pushing for a full review of Cycle Superhighway 7, from Balham to Tooting, which is little more than an off-peak car park covering up some very expensive blue paint at present. The east to west "Crossrail for bikes" on Embankment approaching Parliament Square in Westminster. Somewhat infuriatingly the consultation on the east to west "Crossrail" designs will not even begin until next year, and the north south route has no project delivery timeline at all. 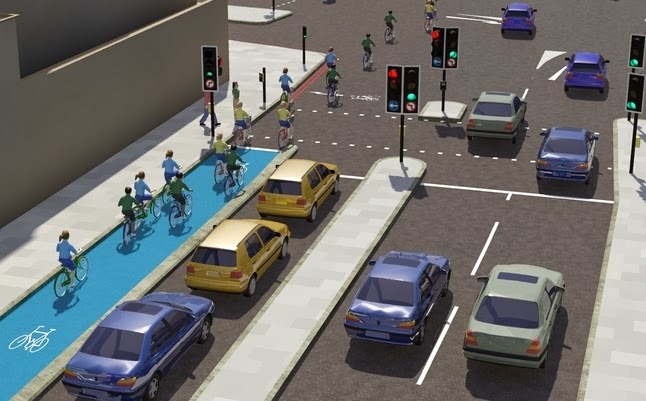 The advanced bicycle traffic lights featured in TfL's kite-flying artist impressions have not yet even been approved and made legal for UK roads by the Department for Transport. Still, speaking generally this is all very positive news, and represents a very significant evolution in the Mayor's thinking about how best to handle people on bicycles. However, the cost cyclists have paid to get to this point has been too high. The night before Boris launched CS2X, I witnessed a cyclist being doored on Saville Row. In Holborn, near the spot where a rider was killed just a few weeks ago, a London cyclist was crushed by a left turning coach on Southampton Row. That cyclist is still in a critical condition. And on CS2 itself a 62 year old porter from Mile End Hospital, Brian Holt, was killed when he was hit by a left turning contruction lorry. London's newspaper, the Standard, described it as "carnage on London's streets", but to campaigners, sadly, it is all too common. More than 65 cyclists have died in London since Boris Johnson came to power, more than half of them under the wheels of heavy goods vehicles. This is set against a background of deaths and reactive protests that have been taking place for years now; on Blackfriars Bridge, around London's most dangerous junctions for cyclists, at Bow roundabout, in King's Cross, and at the Holborn gyratory. Proposals for the original CS2, which most excitingly demonstrate the importance of the seperation of turning movements. Promising, but not solid yet, studff. 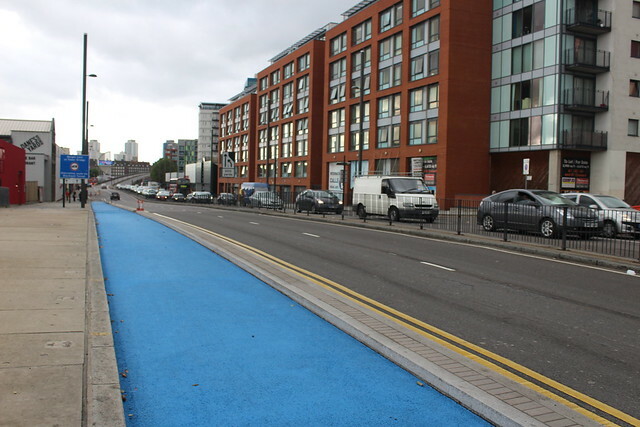 A coroner recently described elements of the pre-existing CS2 route as "confusing" and "an accident waiting to happen" following inquests in to the deaths of Brian Dorling and Phillippine De Gerin-Ricard. With the previous death of Svetlana Tereschenko, and last week Brian Holt, four London cyclists have died on or near CS2 since it was opened in July 2011. Transport for London have a long history of not listening to stakeholders when told that their plans are a bad idea. It's the reason why there was protest in Blackfriars, and they were warned their schemes could lead to fatalities both in Bow and at Kings Cross where cyclists have subsequently died. It seems they are finally waking up and "getting it" now that four riders have died on one of their routes, but it is too high a price to pay for London's cyclists. And TfL can hardly be surprised that some visualisations of infrastructure that might get built in the future, and positive words from the top, will not be enough to keep the pressure from cycling campaigners off. We've all been here before, and tens of London cyclists have died since then when real change should have been happening instead. Of course the latest proposals are very, very welcome. But it's time for a new era of co-operation from Transport for London, where they demonstate that they are listening to stakeholders and are prepared to act on their input. Never again should Londoners die on street designs where the authorities can say that they had been warned from the start. 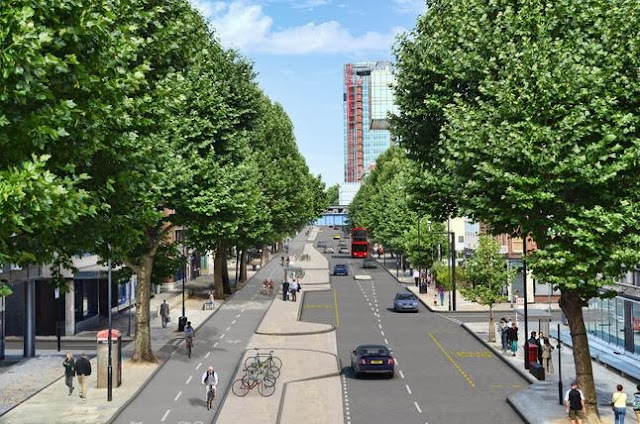 For more on the newly launched extension to CS2 check out this very good report and tour d'horizon about the future of cycling in London by BBC London journalist Tom Edwards. I too am baffled by TfL's split personalities at the moment! Gilligan too – he caves in to Westminster so the CS through Pimlico will be rubbish, but then it seems he's sorted the City into fixing Aldgate. I'm intrigued by your comment that the traffic lights in the visualisation haven't been approved by the DfT. As far as I can see there's nothing there that's not currently within regulations. It's eye-level lights and qualified red symbols that the DfT hasn't approved, but there's nothing in that image but standard existing stuff. Does this mean starting implementation of proper non-conflicting Dutch style traffic light sequences? If there's one thing I hate it's hanging around in the middle of a junction waiting for oncoming traffic to pass. The picture does look interesting, but overengineered. Why the acres of raised pavement separating the two lanes of cars, and the little itty bitty kerb separating cars from cyclists? @departmentfortransport I think split personalities is probably the best way to describe TfL - they are most certainly a many-headed hydra with competing priorities. The pro-bus camp don't much like the cycling camp who don't much like the network assurance camp etc etc. A constant challenge for us! Regarding the traffic lights, I understand that it is smaller bike lights that are yet to be approved, and perhaps this configuration. I shouldn't look too closely at these visualisations anyway, they're a long way off real plans anyway. @Anonymous That would be a nice start wouldn't it! I agree that it does look over-engineered. As with my comment above to @departmentfortransport I wouldn't look too closely at these "artist impressions" - they're a long way off being real plans yet. Just to say that here in Cambridge, we have some eye level lights for cyclists which are being trialed. Unfortunately, some of the rest of the junction layout supposedly to reduce the number of accidents involving cyclists leaves a lot to be desired. I have yet to cycle the junction in the direction that lets me assess them properly.